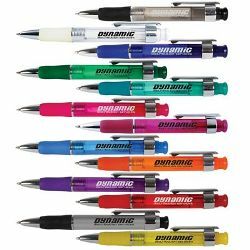 Push button ballpoint pen with rubber grip. Item size (MM) Barrel - 134L x 13D, Grip - 12D. Print Area (MM) 45L x 9H. Colour Available: Transparent Hot Pink, Clear, Purple, Pink, Yellow, Light Blue, Dark Blue, Orange, Dark Green, Light Green, Solid Silver, Red, Black, Charcoal.